After nine seasons with the Tigers, Kirk Gibson left Detroit for free agency, signing a three-year, $4.5MM deal with the Dodgers on this day 26 years ago. The Dodgers immediately got a return on their investment as Gibson won the 1988 NL MVP Award (hitting .290/.377/.483 with 25 homers and 106 runs) as he and Orel Hershiser led Los Angeles to the pennant. Knee and hamstring injuries left Gibson questionable for the World Series, however, and Gibson made just one plate appearance in the 1988 Fall Classic…but it was certainly a big one. Ironically, Gibson is today firmly aligned against the Dodgers in his current role as the Diamondbacks' manager. Scott Boras, Suk-min Yoon's agent, said that "many teams," including the Red Sox, were interested in his client, Nick Cafardo of the Boston Globe reports (Twitter link). The Sox were linked to Yoon earlier this month though it's unknown if Boston is one of the four clubs who have made contract offers to the Korean righty. Boras said that "we'll know more in 10 days," which would seemingly give credence to rumors that Yoon will soon sign with a team. The Orioles were rumored to be considering a contract extenson for J.J. Hardy this winter, though there has been a lack of movement on this front. CSNBaltimore.com's Rich Dubroff wonders if the O's are waiting for Stephen Drew's free agent situation to be resolved since the two shortstops have comparable career numbers. Hardy is scheduled for free agency next winter and his long-term future in Baltimore is in some question given that shortstop is Manny Machado's natural position. A source with direct knowledge of Bronson Arroyo's negotiations tells MLB Daily Dish's Chris Cotillo (Twitter link) to "don't believe everything you read" in regards to Arroyo's claim that he hasn't received a firm contract offer this winter. Vernon Wells is guaranteed $21MM for the 2014 season after being released by the Yankees, and since Wells lives in a state (Texas) with no income tax, FOX Sports' Ken Rosenthal notes that Wells could actually end up losing money if he plays for another team this season. Of course, losing a little more than $1MM in taxes may not be a major concern for Wells (who has banked over $110MM for his career, according to Baseball Reference) if he wants to continue his career. For the first time, MLB teams could sign more free agents to multiyear contracts than one-year deals, Fangraphs' Dave Cameron writes. With more money (particularly from TV deals) coming into the game, Cameron theorizes that teams are more willing to make longer commitments to players. Though the Mets reportedly made a run at Grant Balfour prior to his new deal with the Rays, Jon Heyman of CBS Sports tweets that they're not likely to embark on a similar pursuit of Fernando Rodney. MLB.com's Joe Frisaro reports that the Marlins are interested in adding Vernon Wells. Though Brian Bogusevic projects to be the club's fourth outfielder, the Fish are interested in Wells as a right-handed bench bat and occasional starter. Over the weekend, Nick Cafardo of the Boston Globe noted near the end of his Sunday column that the Phillies have also expressed some early interest in Wells. Phillies reliever Mike Adams is currently throwing from 100 feet and hopes to be ready for Opening Day, writes CSNPhilly.com's Jim Salisbury. The Phils inked Adams to a two-year, $12MM pact prior to last season, but a shoulder injury sidelined him for much of the 2013 campaign. Though the Phillies would like to salvage as much as they can from that investment, it wouldn't be a surprise to see Adams spend the first couple of weeks on the disabled list, Salisbury adds. JANUARY 10: The Yankees have designated Vernon Wells for assignment, according to ESPN's Buster Olney (on Twitter). Wells himself tweeted out a thank you to the organization: "Thank you Yankees for the opportunity to be a part of such a storied franchise." The Yankees need room on their 40-man roster because although they've agreed to deals with Brian Roberts and Matt Thornton, neither has been officially announced at this time (as noted earlier today by Ken Rosenthal of FOX Sports). An Alex Rodriguez suspension could clear a spot for the second player. Wells, 35, was acquired by the Yankees last offseason in exchange for Exicardo Cayones and Kramer Sneed, with New York picking up $13.9MM of the remaining $42MM on Wells' contract. They looked to have caught lightning in a bottle early in the season, as Wells mashed his way to a .301/.357/.538 batting line with 10 homers through his first 38 games, replacing some of the production lost when Curtis Granderson and Mark Teixeira went down with injuries. Wells posted a .495 OPS with just one homer from May 16 through season's end, however, finishing with a batting line of .233/.282/.349 in 458 plate appearances. Wells is owed $21MM this season, $18.6MM of which comes from the Angels, with the Yankees on the hook for just $2.4MM. In a long article outlining the Angels' troubles under Arte Moreno, CBS Sports' Scott Miller reports that the Halos owner was the driving force behind the club's ill-fated trade for Vernon Wells before the 2011 season. Moreno threatened to fire former GM Tony Reagins if he failed to complete the deal within 24 hours, Miller says. Here's more out of the American League.. The Orioles continue to scour the waiver wire in hopes of acquiring another bat, Roch Kubatko of MASNsports.com tweets. The club believes a deal is possible ahead of Aug. 31, but nothing's cooking at the present, Kubatko says. Mariners GM Jack Zduriencik's job seems to be more secure as the club begins a "management shakeup," Yahoo! Sports' Jeff Passan tweets. Special assistant Tony Blengino has been fired, according to Passan. Meanwhile, the club continues to remain silent on Zduriencik's future, FOX Sports' Jon Paul Morosi says. Neither President Chuck Armstrong or chairman Howard Lincoln have publicly stated that Zduriencik will return next season. Bill Madden of the New York Daily News runs through lame duck managers around the majors, calling the Yankees' Joe Girardi a manager of the year candidate and urging the Mets to bring back Terry Collins. However, Ned Yost of the Royals and Eric Wedge of the Mariners are in line to be let go, while the Tigers' Jim Leyland should be on the hot seat, Madden says. Erik Bedard confesses he was surprised after being informed he will shift into a relief role for the Astros, a move manager Bo Porter says will allow the club to get a look at a young pitcher. "They said they looked at my last two years and my innings total was around where I'm at right now, and they said if I keep pitching I'll be about 40 over, and I said, 'Yeah, that's the point,' Bedard is quoted as saying in an article by Brian McTaggart of MLB.com. Bedard, who signed a one-year, $1.15MM minor league deal with the Astros in the offseason, cleared waivers earlier ths month and is eligible to be traded. Orioles pitching prospect Kevin Gausman could join the major league club prior to roster expansion in September, and would likely slot into the bullpen, Brittany Ghiroli of MLB.com says. Gausman was ranked the No. 26 prospect in baseball after the 2012 season by Baseball America, but posted an unsightly 6.21 ERA in 33 1/3 innings after being called up earlier this season. The Angels' apparent dysfunction seems to stretch back years, judging from a report by Scott Miller of CBS Sports. Miller reports that, in 2011, owner Arte Moreno threatened to fire then-GM Tony Reagins if he couldn't trade for outfielder Vernon Wells within 24 hours, effectively backing Reagins into a corner. That might partially explain the remarkable, and disastrous, result, which had the Angels taking on $81MM of the $86MM remaining on Wells' contract, while also giving up Mike Napoli in the process. The Jays, meanwhile, traded Napoli to the Rangers for Frank Francisco and cash. Miller reports that Moreno's motivation for the Wells ultimatum was that he was upset that Texas had acquired Adrian Beltre weeks earlier. As a result, not only did the Angels take on $81MM in salary, they also set in motion a chain of events in which their division rivals also ended up with Napoli, who was one of the best hitters in baseball that season. Here are more notes from the AL West. The Rangers were interested in Daisuke Matsuzaka, CBS Sports' Jon Heyman writes. Matsuzaka, who had previously been released by the Indians, recently signed with the Mets, with whom, Heyman notes, he could receive more playing time. Mariners GM Jack Zduriencik still won't confirm recent reports that he has received an extension for 2014, MLB.com's Greg Johns tweets. Zduriencik does, however, say he's "raring to go" for 2014. Geoff Baker of the Seattle Times, meanwhile, tweets that there's "some debate" about whether team president Chuck Armstrong ever confirmed the extension. Here's the latest out of the American League East.. Whether you like the Yankees spend-heavy ways or not, you have to give General Manager Brian Cashman a great deal of credit, writes Joel Sherman of the New York Post. While detractors could call the Bombers lucky for finding diamonds in the rough such as Travis Hafner, Vernon Wells, and Lyle Overbay, it's difficult to write off similar success Cashman has had in the two years prior with unheralded acquisitions. Despite the club's recent slide, Red Sox manager John Farrell says that this is not the time for a shakeup, writes Peter Abraham of the Boston Globe. Here's more on the Red Sox from earlier today. Over the course of 48 hours last week, teams handed out nearly a half-billion dollars in long-term deals to Justin Verlander, Buster Posey, Adam Wainwright and Paul Goldschmidt, Bob Nightengale of USA Today notes. But not all of those expensive contracts go well, which leads to, for example, last week trade of Vernon Wells from the Angels to the Yankees. "We're becoming like the NBA," says Brewers GM Doug Melvin. "Instead of old-fashioned baseball trades, we're trading contracts. I can see more of these in the future. And that's concerning." A sidebar to Nightengale's article lists how much each team will be paying other teams this year, much of it for contracts gone bad. The Angels are paying the most money, most of it going to the Yankees for Wells. The Pirates are receiving the most money, much of it coming from the Yankees (for A.J. Burnett) and Astros (for Wandy Rodriguez). Here are more notes from around the league. Two bad months — a bad August 2011 for the Red Sox, and a bad August 2012 for the Indians — helped create the 2013 Indians, Paul Hoynes of the Cleveland Plain Dealer writes. Without the Red Sox's bad month, Cleveland wouldn't have been able to hire manager Terry Francona, and without the Indians' 5-24 August, the team's ownership might not have felt the need to make a splash in the offseason. That month of "zombie baseball" led to the acquisitions of Nick Swisher, Michael Bourn, Brett Myers and Mark Reynolds, Hoynes argues. The Red Sox will see former star Kevin Youkilis as he makes his regular-season debut with the Yankees on Monday, Peter Abraham of the Boston Glove notes. Youkilis signed a $12MM deal with the Yankees in the offseason. "It’ll be weird," says Boston's Jon Lester. "I wouldn’t never thought that it would happen. But he made that choice for him and his family. I’m sure he’s excited about it." Pirates second baseman Neil Walker also says he isn't likely to discuss a long-term contract with the team during the regular season, Michael Sanserino of the Pittsburgh Post-Gazette reports (on Twitter). The Bucs have not made a new offer to Walker, either, Sanserino says. Walker will make $3.3MM in 2013 in his first year of arbitration eligibility. The nine top names to watch in Los Angeles baseball in 2013 include Chase Headley and Robinson Cano, argues Bill Shaikin of the Los Angeles Times. Headley could be an in-season trade target for the Dodgers, and Cano will likely be connected to the Dodgers as a free agent next winter. Shaikin also suggests that if the Dodgers don't do well in 2013, they could try to hire Rays GM Andrew Friedman. Here are more notes from the West divisions. The Mariners' decision to keep Jason Bay and designate Casper Wells for assignment doesn't make sense, Jeff Sullivan of USS Mariner says. Sullivan notes that Wells is younger, had four years of team control remaining, and has recently been the better player on both offense and defense — and the Mariners will likely lose him for virtually nothing. "Wells, probably, is going to end up getting traded to a team with a thin outfield in exchange for a non-roster barely-prospect," Sullivan says. Sullivan also points out that Wells was one of the key players in the Doug Fister deal with the Tigers. The Tigers already looked like clear winners in that trade, but it's even clearer now. The Giants' signing of Buster Posey to an eight-year, $159MM contract demonstrates the inequities between the Giants and the Athletics, Susan Slusser of the San Francisco Chronicle writes. The Giants have opposed the Athletics' move to San Jose. "It's more than mildly ironic that the Giants granted a single player a contract that exceeds the A's entire payroll by a factor of three," says San Jose City Councilman Sam Liccardo. The trade of Vernon Wells to the Yankees gave the Angels additional payroll flexibility, Alden Gonzalez of MLB.com writes. The deal leaves the Angels about $6MM under the luxury tax threshold, Gonzalez reports. The Mets are "in desperate need of clearing several spots" on their 40-man roster, and have "put out word to other teams that they are interested in moving non-core prospects" who would have to pass through waivers to be retained, writes Adam Rubin of ESPNNewYork.com. With the team likely in need of four roster vacancies to account for players who figure to be added to the 40-man before Opening Day, the Mets could look to move players such as Gonzalez Germen, Darin Gorski, Reese Havens, Juan Lagares, Cesar Puello, Elvin Ramirez, and Hansel Robles, according to Rubin. The Blue Jays could be interested in the aforementioned Havens, tweets Andy Martino of the New York Daily News. Havens, a 25-year-old second baseman, has yet to see big league action and hit .215/.340/.351 over 390 Double-A plate appearances last year. After allowing him to reach free agency, the Brewers "didn't want to touch" Shaun Marcum this offseason due to injury concerns, tweets Martino. Marcum, now with the Mets, is looking unlikely to start the season in the rotation due to neck and shoulder issues, Anthony DiComo of MLB.com explains. The Yankees "will not receive credit on their 2014 luxury-tax payroll" for recently-acquired outfielder Vernon Wells, tweets FOX Sports' Ken Rosenthal. Instead, "the charge for him will simply be zero." Rosenthal had previously discussed the complicated background of the Yankees' attempt to maximize their ability to get under the luxury tax threshold in structuring the Wells deal. Wells is still due $42MM over the next two seasons as he plays out the end of his 7-year, $126MM deal. As Rosenthal explains, the Yankees will pay him $13.9MM of the remaining obligation, with only $2.4MM of that allocated to 2014 for purposes of luxury tax avoidance. Rosenthal discussed the financial impact to the Yanks for acquiring Wells, questioning whether the club might have been better served by instead inking Russell Martin this off-season. In particular, Rosenthal explained that Martin told New York that he would agree to a one-year deal for around $9-10MM before he agreed to terms with the Pirates on a two-year, $17MM contract. Discussing his contract, which he originally signed with the Blue Jays before it was famously assumed by the Angels, Vernon Wells acknowledged that "no one's worth that kind of money," tweets Andy McCullough of The Star-Ledger. Wells continued: "It’s what the market’s worth at that time … I caught the market at a good time." While commentators and fans seem skeptical of the Yankees' prospects for 2013, as well as their recent roster moves, GM Brian Cashman is resolute, writes McCullough (hat tip to River Ave. Blues). Cashman says that any notion of rebuilding is "just not part of our DNA," and rejects the notion that the team has been holding back on spending, though he acknowledges that he intends to "tread water until the guys come back." In terms of philosophy on long-term commitments, Cashman says he will not be "gun-shy," but nevertheless will be "more choosy" going forward. Cashman also discussed the decision not to beat the Mets' offer for then-Twins hurler Johan Santana. Unlike current Yankees starter C.C. Sabathia, Cashman noted, Santana profiled as a "high-risk player going forward, health-wise." 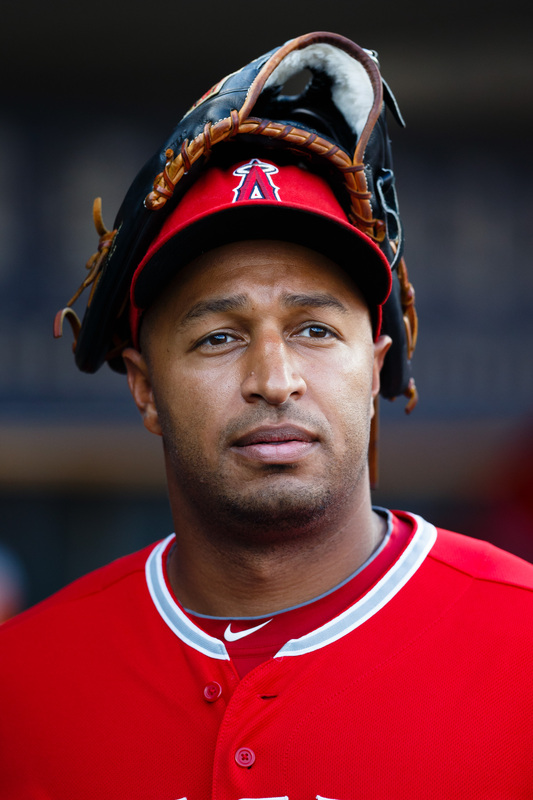 A player with a supposedly untradeable contract has been dealt for a second time, as the Yankees acquired outfielder Vernon Wells from the Angels on a salary dump deal. The trade was announced officially today, and the Halos received a couple of token minor leaguers in outfielder Exicardo Cayones and lefty reliever Kramer Sneed. The big benefit for the Angels was salary relief, as the Yankees will reportedly assume a surprising $13.9MM of the $42MM owed to Wells for 2013-14, of which they'll pay $11.5MM this year to avoid a luxury tax hit in 2014. Wells was happy to waive his no-trade clause and escape a likely fate of being buried on the Angels' bench. Wells, 34, was acquired to serve as the Yankees' everyday left fielder until Curtis Granderson returns to the lineup in May from a broken wrist. Signed to a seven-year, $126MM extension by the Blue Jays in 2006, Wells posted a solid year in 2010 that allowed Toronto to unload most of his remaining $86MM on the Angels, which also cost the Halos Mike Napoli and cost GM Tony Reagins his job. Wells performed terribly after the trade, hitting .222/.258/.409 in 791 plate appearances. It was surprising to see the Yankees essentially give a two-year, $13.9MM contract to a player most teams would consider a fourth outfielder at best. By comparison, the Cubs signed Scott Hairston this offseason for two years and $5MM. The trade is a big win for Angels GM Jerry Dipoto, who unloads a player he didn't need and avoids the Competitive Balance Tax. Cayones, 21, was acquired by the Yankees from the Pirates in the A.J. Burnett trade in February of last year, so he's again attached to a salary dump. He hit .228/.374/.291 in 200 Low-A plate appearances last year, playing mostly right field. Sneed, 24, posted a 5.37 ERA, 6.9 K/9, 5.7 BB/9, and 0.71 HR/9 in 63 2/3 High-A innings last year. Neither is considered much of a prospect, which makes sense with the Yankees assuming so much of Wells' contract. Yahoo's Jeff Passan first broke the story on Sunday, with Jim Bowden, Mike DiGiovanna, Alden Gonzalez, Jon Heyman, Buster Olney, Joel Sherman, and Mark Feinsand also contributing along the way. Photo courtesy of USA Today Sports Images.